A lot has been written about how the “sharing economy” isn’t really about “sharing” – many of the companies that use the term are more about renting, buying and selling, or even just working. 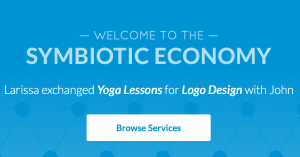 A new site called Simbi wants to change that, offering a platform where users can exchange services for Simbi credits (short for “symbiotic”) for everything from yoga and massage to guitar lessons to video editing. Still, for now the site is entirely free, and has a pretty diverse range of services to choose from. Listing a service of your own is easy, and you can create both virtual and in-person offerings. When I browsed some the listings in my own city, I found dozens of massage therapists, personal chefs, and even a sound engineer offering to record a song for 100 Simbi credits. Most of the services are valued at 50-100 credits per hour, similar to what you might pay in dollars for a private yoga lesson or massage. While it may not be sustainable to offer a professional skill solely through the barter economy, a site like Simbi could be a great way to meet clients who might be willing to pay in cash on future visits. You can also trade “fun & quirky” services, like book recommendations or video game tips, for just a few Simbi credits. One person will “listen to your conspiracy theory” for 20 credits! Check out the intro video below or head over to the site and open up your account. You’ll get free credits (enough for a service or two!) just for joining. Let us know if you find any interesting services or make a successful barter!